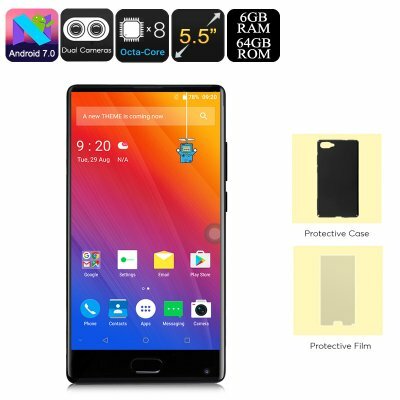 Successfully Added HK Warehouse Doogee Mix Android Phone - Octa-Core, 6GB RAM, Dual-IMEI, 4G, Android 7.0, 5.5-Inch Small Bezel Display (Black) to your Shopping Cart. With its bezel less display, the Doogee Mix Android phone treats you to a visual experience like no other smartphone in its price range. The 5.5-Inch HD display features Samsung AMOLED technology. Thanks to this, it puts forth stunning detail and vivid color for you to enjoy. The screen itself is large and features almost no bezels. This will further increase your overall media experience while using this Android phone for watching movies and playing games. No matter for what purpose you use this Android phone, you’re sure to be treated to an absolutely stunning user experience. Beneath this breathtaking display, your Android smartphone holds some significant hardware. With the latest Helio P25 processor and 6GB RAM in place, you’ll be able to tackle the latest software out there. This Octa-Core CPU has been clocked at 1.68GHz thanks to which it brings forth a powerful yet energy efficient performance. With 64GB ROM and a 128GB SD card slot, you’ll be treated to all the needed storage space to keep your files and media. Accessing these files has never been easier thanks to the phone’s ultra-fast fingerprint scanner that comes with 360-degree identification. This lets you access your phone with the simple touch of a finger. The Doogee Mix smartphone comes with Dual-IMEI numbers and 4G support. This treats you to ultimate connectivity no matter where you’re at. The next time you’re outside or enjoying a holiday abroad, you won’t have to worry about staying in touch with friends and family back home. During your trips, the phone also lets you shoot stunning pictures and 4K video with its professional-grade 16MP dual-rear camera. From now on, not a single special moment in life will pass by without snapping the perfect photograph. The Doogee Mix smartphone comes with a 12 months warranty, brought to you by the leader in electronic devices as well as wholesale Android phones..